Detailing the physical features, habits, territorial reach and other identifying qualities of the Eastern-tailed Blue Butterfly. The charming Eastern-Tailed Blue Butterfly is a small, delicate visitor to flowers of all kinds. The Eastern-Tailed Blue Butterfly is a member of the Gossamer-Winged Butterfly group. They are light and airy, floating through the air on delicate wings. This species is a part of the Blues tribe, where most members are shades of blue, from a pale steely hue to rich azure. Males have royal blue wings when they are open flat while females' wings are more brown. When closed, the underside of the wings for both genders are pale blue with black/gray markings. Two orange eyespots on each hindwing is thought to help confuse bird predators. If the bird mistakes the eyespot for an insect's head and pecks at it, a small part of the wing may be damaged, but the butterfly escapes virtually unharmed. The Eastern-Tailed Blue Butterfly enjoys sitting on flowers and stems with its wings open, occasionally rubbing the hindwings together as if to scratch an itch. It is the only Blue on the eastern part of the continent with a 'tail' on the ends of each wing. Males tend to socialize at puddles or wet mud in what are called "puddle parties". 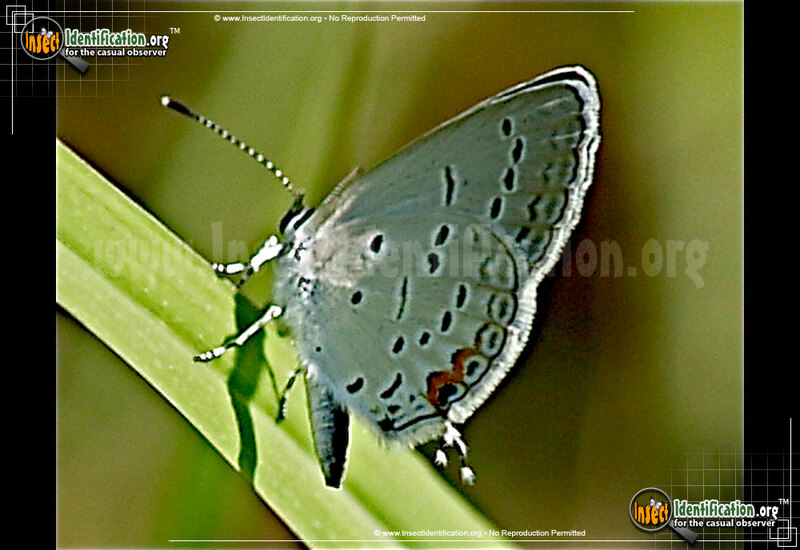 This small butterfly can be found in parks, gardens, meadows and anywhere else flowers are abundant. The caterpillar of the Eastern-Tailed Blue Butterfly feeds on the leaves of flowering plants and a variety of bean plants.